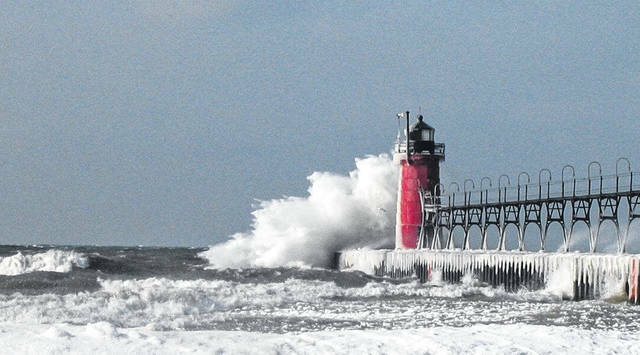 Wintry weather hits the South Haven Lighthouse at South Haven, Michigan. So, what are the “Witches of November,” you are probably wondering? When Halloween wraps up, November begins and that’s when meteorologists start looking for “witches.” Instead of the ones that fly on brooms, these witches are superstorm systems created over the Great Lakes. These late autumn intense storms are referred to as Witches of November or White Hurricanes, Freshwater Furies and November Gales and they can produce 100 mph winds, 35-foot waves along with whiteout snow squalls. They can also drop several inches of rain or snow and produce record low barometer readings. Since the mid 1800’s there have been over 24 of these cyclones recorded over the Great Lakes. Yes, believe it or not, Ohio has a “hurricane season” and it’s quickly approaching. Less than a two hour drive from Indian Lake lies Lake Erie, part of the Great Lakes chain which makes up the earth’s largest network of freshwater seas. It is well known that the Great Lakes have their own unique weather systems and produce their own independent weather storms. Come November Lake Erie and the other Great Lakes can be very beautiful and very scenic, but at times they can be treacherous and deadly due to the ‘Witches of November.” The November Witch produces strong winds (which can mimic a category 1 or 2 hurricane) that recurrently roar across the Great Lakes during the Autumn season. Cold Canadian air collides with warm air moving northward from the Gulf of Mexico which can result in these strong storms on the Great Lakes. Over 6,000 ships have fallen to the rough seas caused by these November Witches of the Great lakes, taking more than 30,000 lives, according to the Great Lakes Shipwreck Museum. It is believed that more shipwreck remains are scattered at the bottom of all 5 Great Lakes than anywhere else in the world. In Ohio, one of the largest concentrations of shipwrecks in all of the Great Lakes is the area around Port Clinton and Put-in -Bay. Enormous swells form during bad weather and tragically ships are easily swallowed up by the sea in these treacherous conditions. On November 10, 1975 the largest and most famous Great Lakes freighter to perish from the Witches of November was the SS Edmund Fitzgerald. Gordon Lightfoot, a Canadian singer songwriter uses the expression “Witch of November” in his popular 1976 song “ the Wreck of the Edmund Fitzgerald”. This is the storm that the “Witch of November.” was actually named after. One of the more recent Witches that battered into the Great Lakes occurred on October 26, 2010 and was dubbed the “Chiclone” because it hit the Chicago area particularly hard bringing hurricane strength winds and 20 to 26 foot waves to Lake Superior and Lake Michigan. Many tornadoes were reported in the region and Ohio incurred wind gusts of over 70 mph. The last major Witch of November Great Lakes storm struck on Halloween 2014, forming above Lake Michigan.